This practical workbook invites you on a twenty-five day journey that takes an entrepreneurial idea, refines it, and makes it into a reality. Throughout the journey, you will come to understand the motivational and spiritual aspects of starting a new enterprise and bringing your vision to life. The workbook begins with an exploration of your 'vision' by asking, "What are your dreams and desires, and what is your vision for the world?" Perhaps you have an inspiration to start a new humanitarian organization, or a new ministry? Or maybe it's an idea to start a new commercial enterprise? Step by step the workbook takes you through the essentials for achieving your entrepreneurial goal. 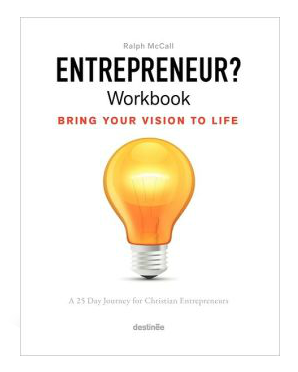 It is an essential guidebook on Christian entrepreneurship.